After our unexpected delay in Rapid City, SD to repair Dan’s truck (under warranty yay! 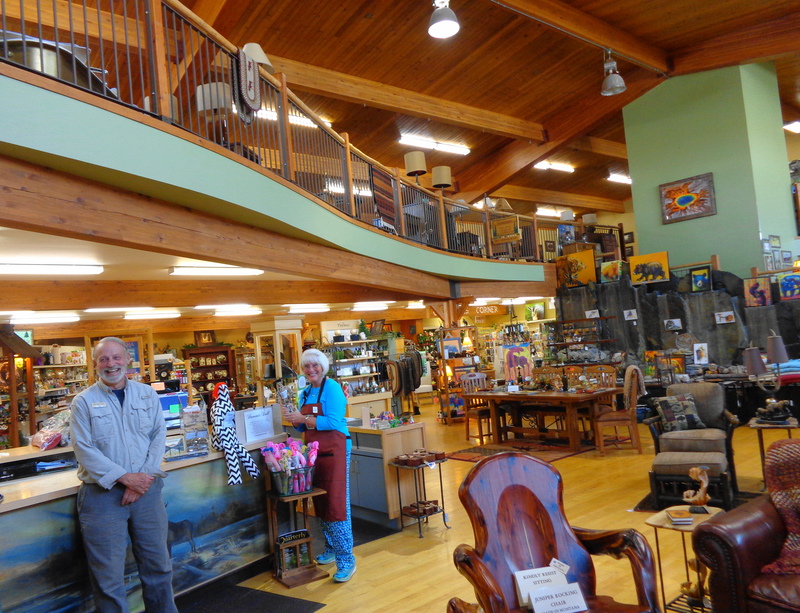 ), we spent the next two days travelling to our summer job in West Yellowstone, MT. It was a beautiful drive, and we knew our destination was ahead when we hit this sign. 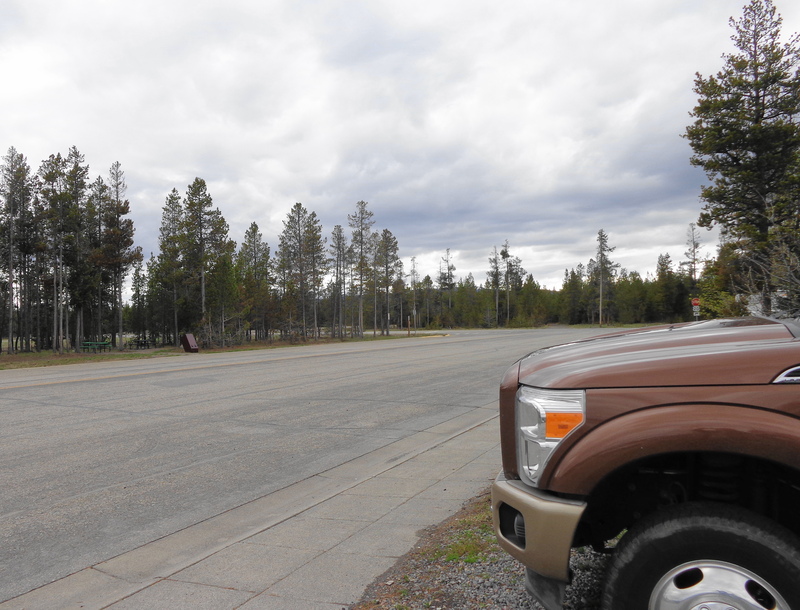 We were pleasantly surprised by the town of West Yellowstone, population 1300, located at the west entrance to Yellowstone National Park. 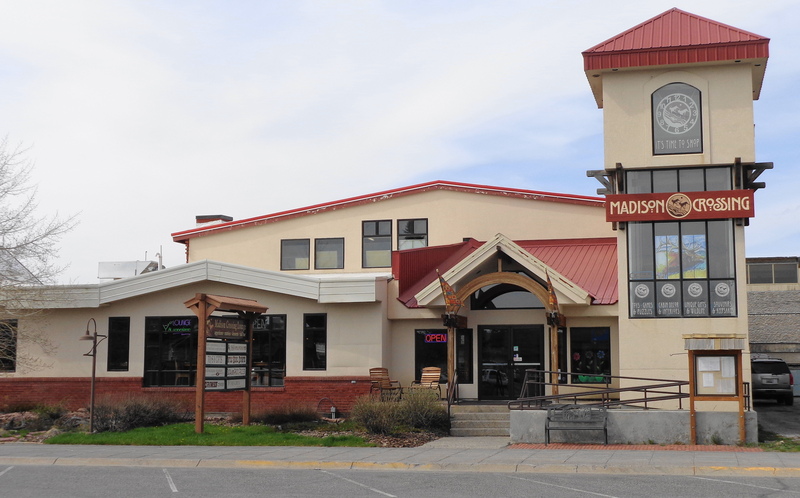 For such a small town, it has a lot to see and do in the area, besides the big park. We feel this will be a good summer for exploring. There are a few RV parks in town, but they charge very high daily fees. 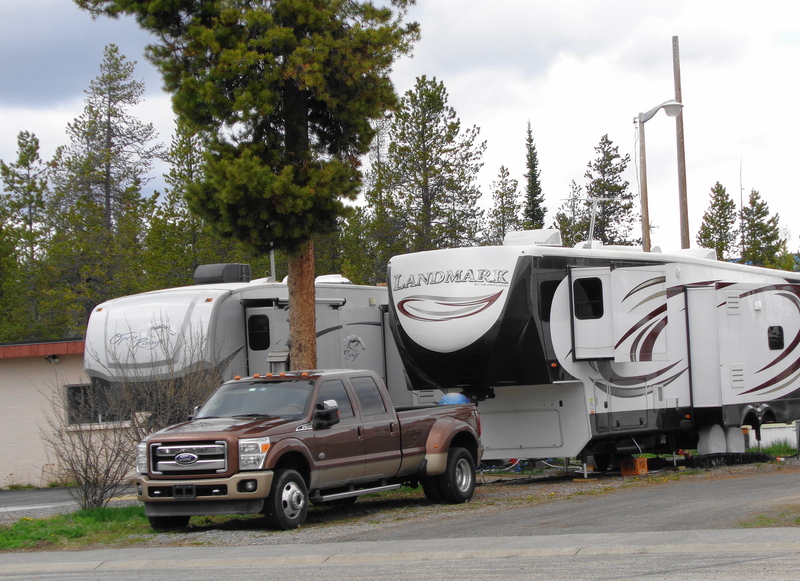 As such, work campers are usually tucked away in spots throughout the town that locals rent out to businesses. If you drive around and look in the alleys, you will see RV’s tucked all over town. We are on the edge of town, in a quiet area, with one other RV. It is not a glamorous spot, but it has 50 amp full hook-ups, and will be free, to us, for the entire summer. Across the street from our spot, is US Forest Service land, which has some nice trails and a place to let Makena play off leash. And beyond the forest, lies a beautiful view! The day after we arrived, we started our summer jobs. 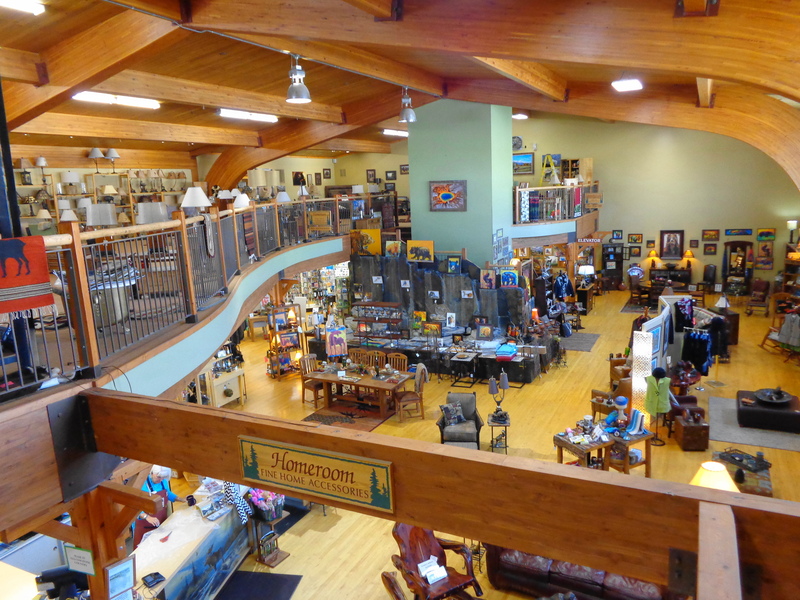 We will be working at Homeroom at Madison Crossings, a cabin decor gift shop. There is one other work camper couple, Tom and Ellen, that recommended the job to us. The building was the old school in town. Originally built in 1918, it was a 3 room school, and expanded over the years. In 1954, a gymnasium was added on, and that is the location of the gift shop. It remained in use until 1992, when a new school was built. In 1993, an elevator and 2nd floor was added to the gym. 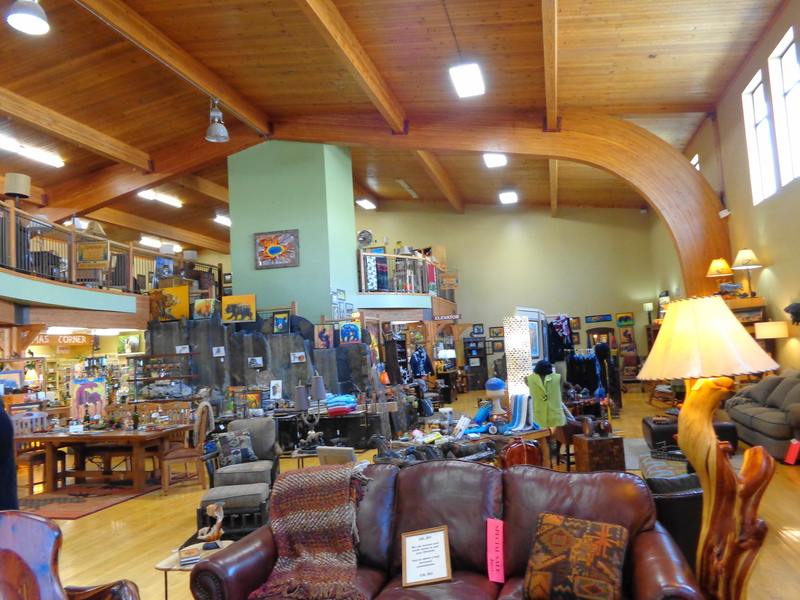 The floor, wood beams, and two of the lights are original to the building. Down the hall is the old gym (a “half court gym”) and the stage. 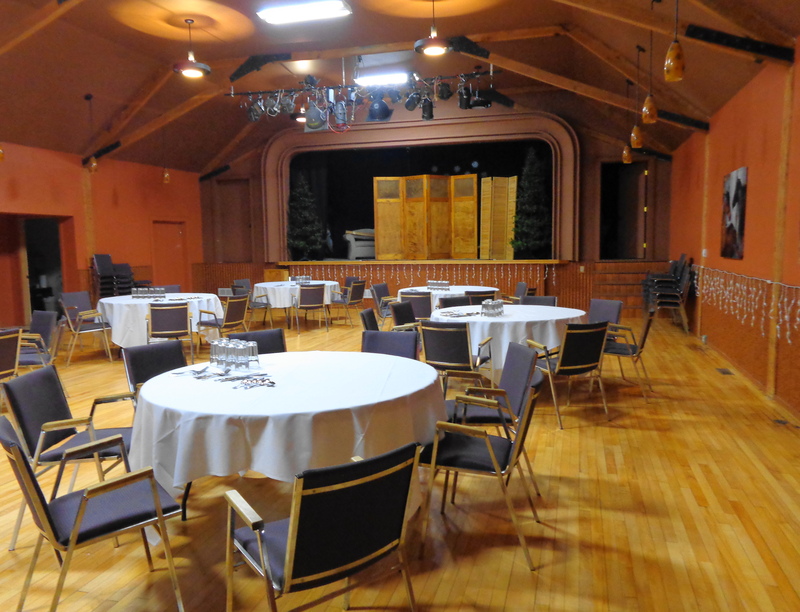 Today it is used for banquets. For those curious about work camping and what it pays, we will be making $9.00/hour, with a 50 cent an hour completion bonus for every hour we work. In addition, we will receive free access to the fitness center in the building, ($40/month value), and our site is free, including electric. We will also receive a discount on any purchases we make in the store as well as the restaurant that is in the building. We already had visitors! George and Laurie (Owens on the Road) stopped by for a visit on the way to their summer job in Montana. It was great getting caught up with some fellow Amazon workers. We will be working Wednesday through Saturday, eventually working 10 hour days once the tourist season gets in full motion. I need to lose 1/2 pound! Hello everyone! While my parents are busy waiting for their truck to get fixed, I thought I would update the blog. For those new to the blog, I like to give a perspective on full-timing from the dog’s point of view! While I was sad when we left Florida, I was eager for new sights, smells and places to pee. I especially enjoyed our trip to North Carolina, because I had a big house to explore and play in. 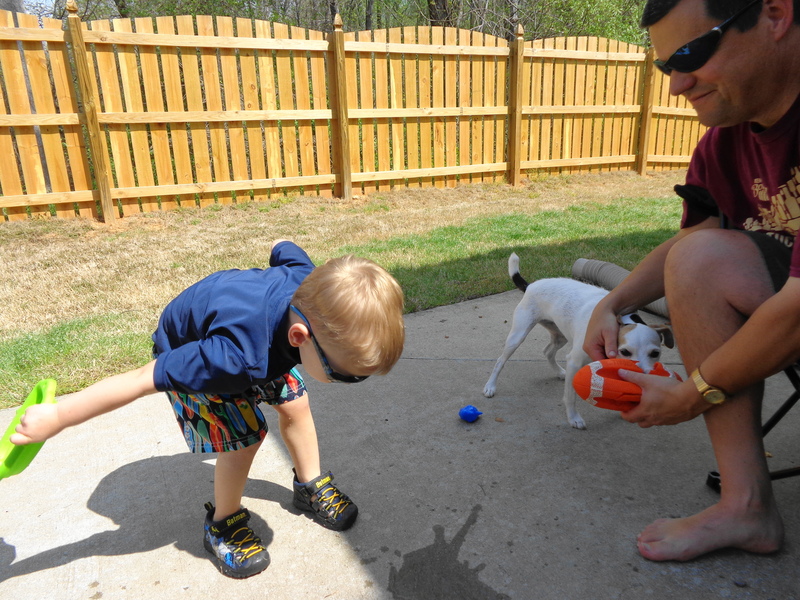 Austin and Cole were eager to play with me, and throw my football. 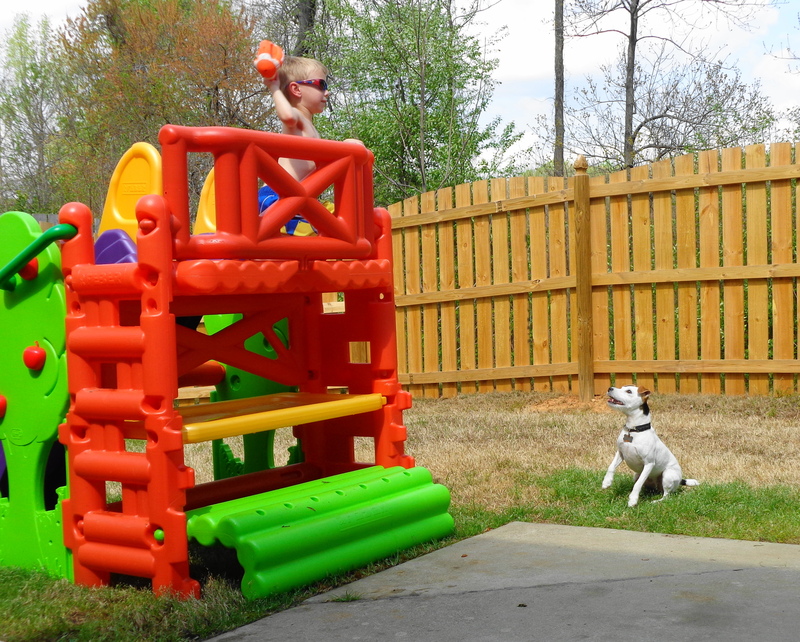 Kids have so much more energy than adults do, so I get to play a lot longer with them. They even wore me out! Superhero’s can do that! 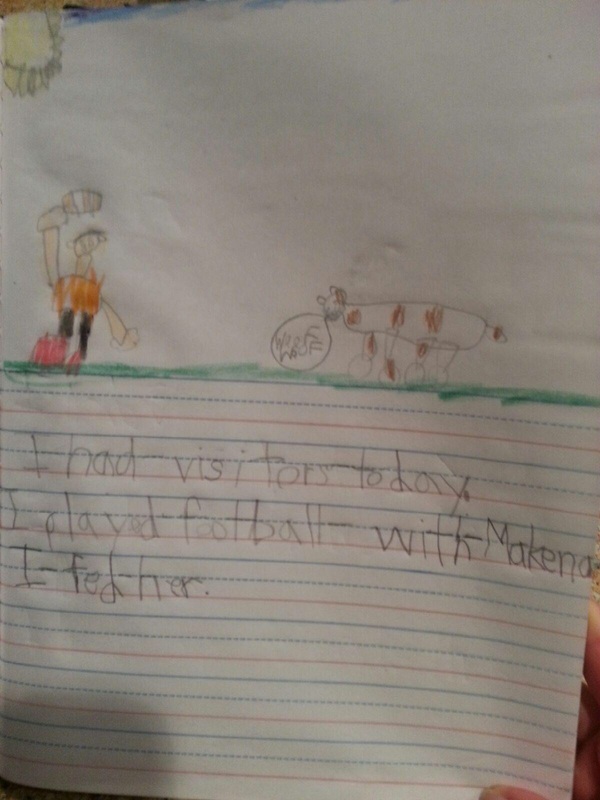 Cole even wrote about me in his school journal. Perhaps his mom and dad can think about getting a dog?? Thank you Jodie and Chris for letting me come and play! 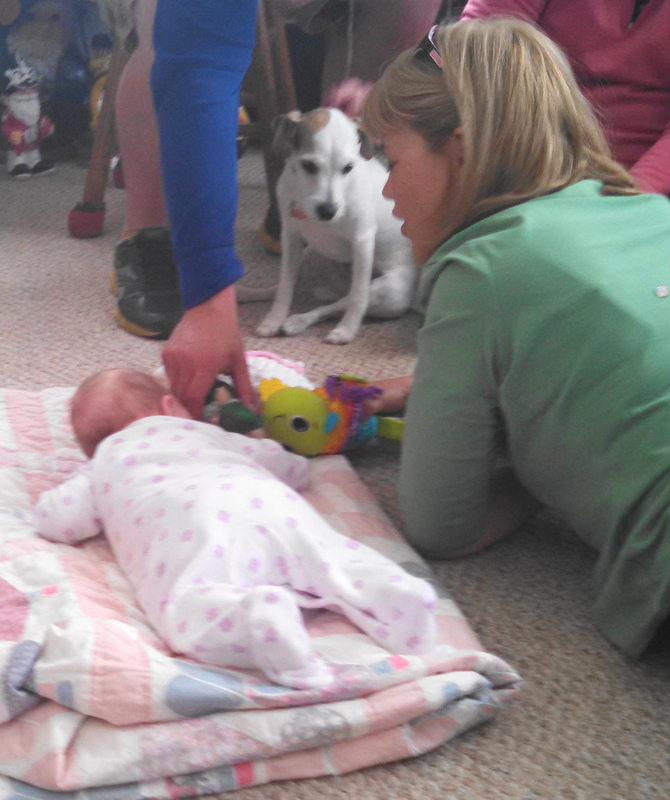 Baby Ellie seemed to upstage me, but I am hopeful she will get bigger and I can teach her how to throw the football to me! Congrats to Kyle and Lauren and their first child! My parents took me down to the Milwaukee area to hang with my cousins, and get my doctor’s appointment. The doctor was not happy that I have gained 1/2 pound since my last visit. This may not sound like a big gain, but he is being pro-active, and I appreciated that! He didn’t comment on how much weight my parents have gained since Amazon, but the two are related! They promised the doctor they would get back into the habit of daily walks for me. The doctor also wanted to have my teeth cleaned, but my parents are hesitant to do this, as they would have to put me under. They have heard about other dogs that did not make it through a routine cleaning, so they are afraid to do it. 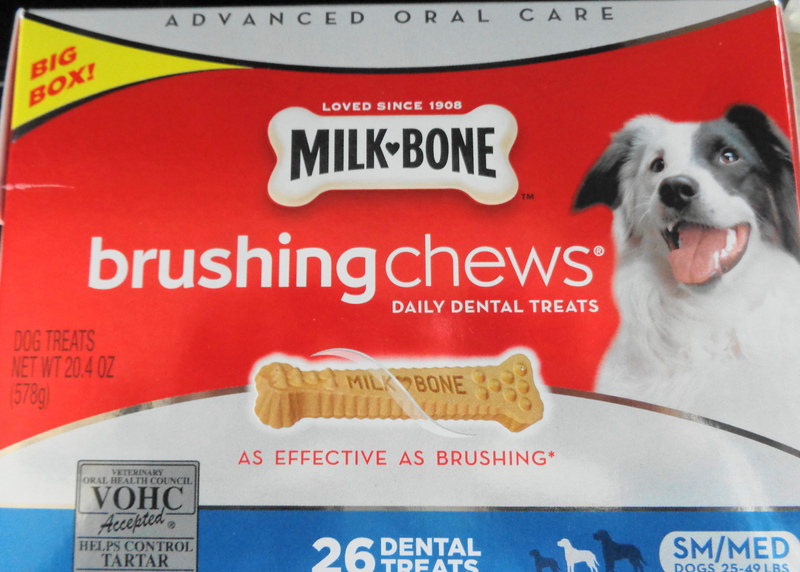 On the positive side, after my visit, my parents stopped at the pet store and bought me some new footballs, and a box of dental chews!!! WooHoo!! Treats and toys! Thanks you doctor!! I am really liking these, and my parents hope they work! They also bought a toothbrush and toothpaste….we’ll see how that goes! I did get to spend a few days with my grandparents, and they took me for daily walks and lots of playtime! 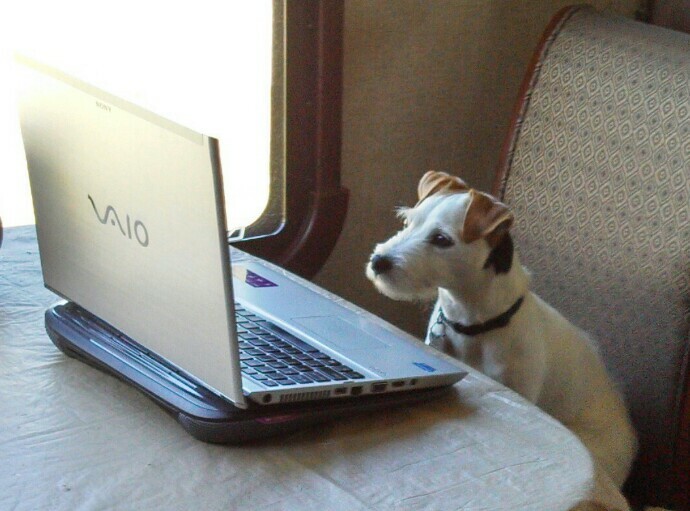 If you ask any full-time RVer, they will say it can be easy to lose track of what day it is. I have no idea about the days of the week, but I do know about the seasons. It should be warm, warm, cool and a little cooler. But I was all mixed up yesterday when I woke up to this nonsense! 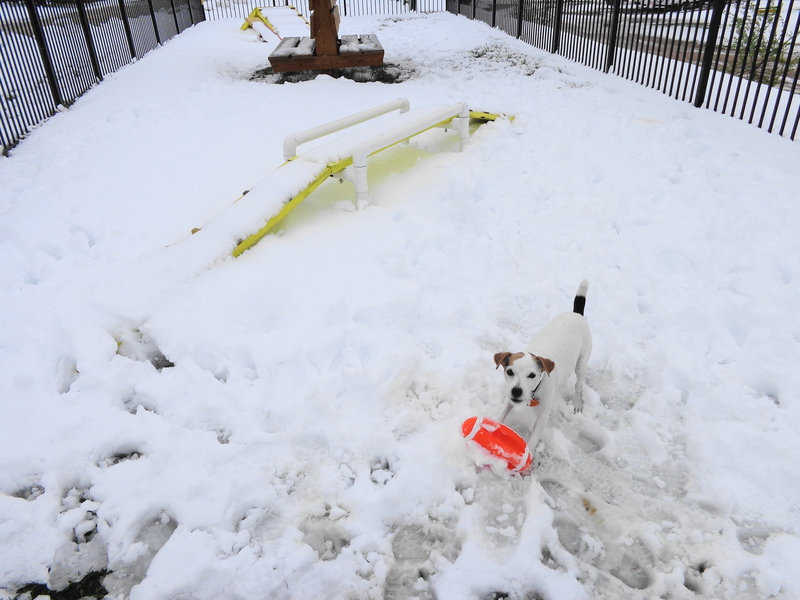 Who put all this snow in my play area at the campground? Yuck! But at least my parents are still getting me out to play, so I can lose my 1/2 pound! I think we will be ‘hitching up’ soon, and getting out of this crazy weather to head west for the summer. I am looking forward to more areas to play, and I hear there is a lot of wildlife to see (from the comfort of my parents truck)! A busy few weeks in Wisconsin//Stuck in South Dakota! 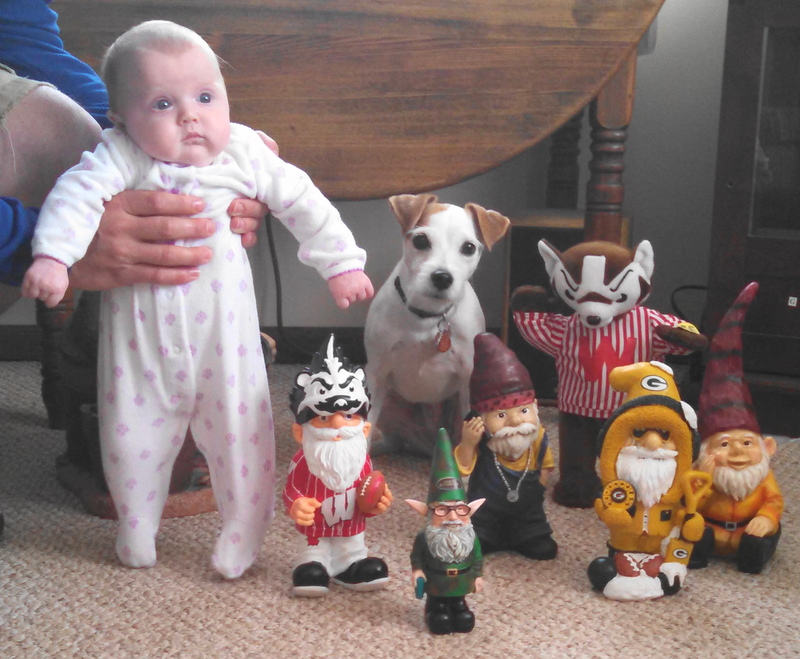 Our time in Wisconsin has gone by fast, as we get ready to head out to West Yellowstone, Montana for our summer jobs. I spent several days getting poked and prodded with all sorts of medical tests. I knew I was in for some fun when my doctor said “welcome to your 50’s, let’s get a colonoscopy! !” Makena also had her veterinary appointment, but Dan declined any visits at this time. He wanted to wait and see how our new insurance will cover all my tests, before he undergoes his own. We were happy that they covered everything at 100%. Unfortunately, Assurant Health has decided they were not making as big of a profit under the new law, so they are going to sell off their health insurance line of business, but keep the more profitable ‘pre-paid funeral expenses’ and other ‘disability’ lines of insurance. So next year we will be looking for a new carrier. We will try to schedule Dan’s appointments in the fall, before we start back at Amazon. We cleaned and defrosted the refrigerator, and fully restocked our freezer and pantry. The nearest Wal-Mart to West Yellowstone is 84 miles (one way), so we wanted to stock up on food. There is a grocery store in town according to our employer, but with being in such a remote area, we are anticipating “sticker shock” on the food prices. We were able to visit with some friends and family, but time goes by too fast to see everyone. 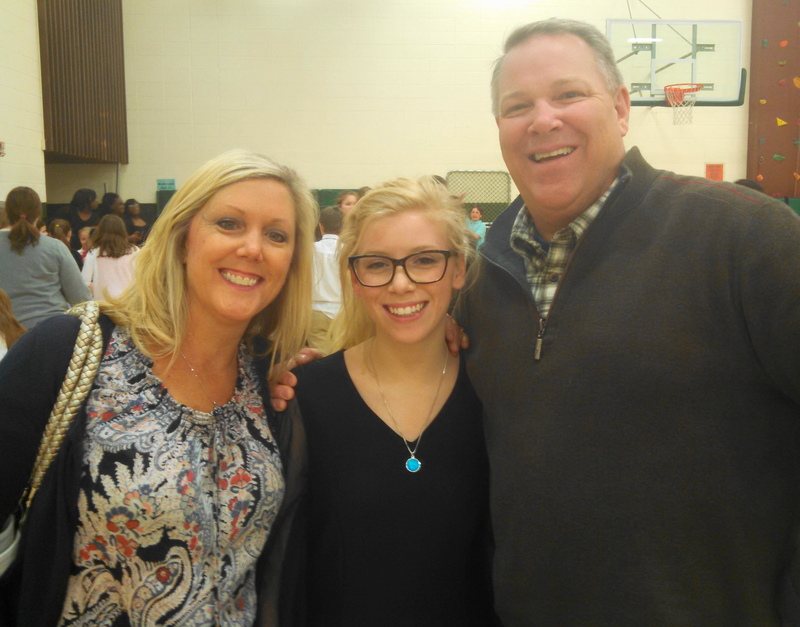 My niece Molly had her last all district choir concert, which we were able to attend. Not sure who was more excited….my niece or my sister and brother-in-law realizing they did not have to attend any more of these performances! We did enjoy Molly’s performance. 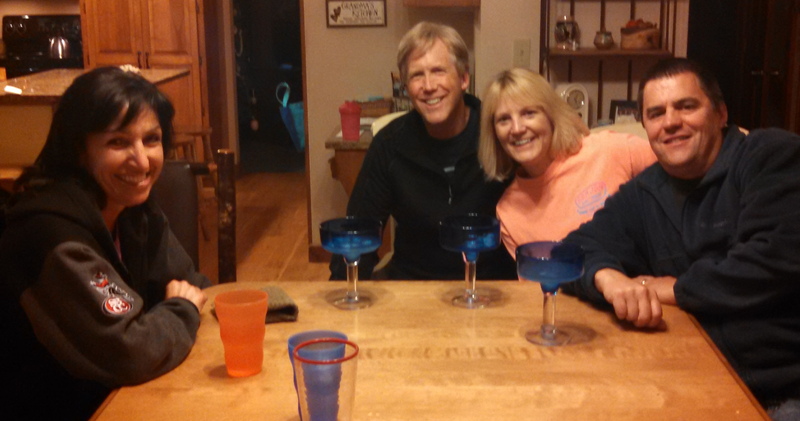 We also celebrated my sister-in-law Annette’s birthday. Dinners with friends Dave and Angie, Mike and Karlyn and Robin and Mary on various nights reminded us we need to start exercising again! Good thing there a lot’s of hiking trails in Yellowstone! 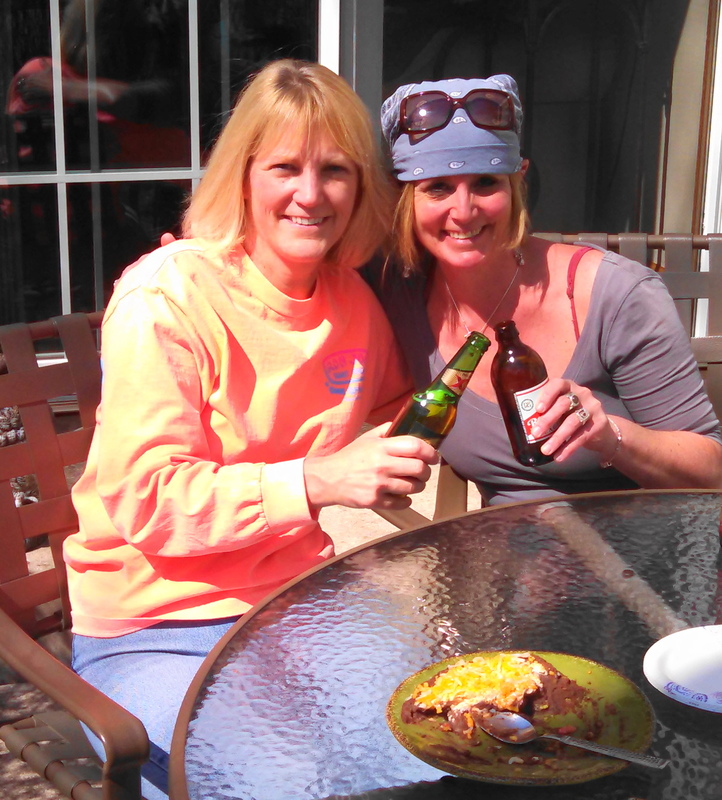 And we had our now annual ‘patio beer’ with my former co-worker Amy! I started a draft of this blog a week ago, and was planning on posting it when we left Wisconsin. We had to leave a few days earlier than expected, because of some additional repair work that needed to be done on the 5th wheel. Look for a future post on that. After leaving Indiana, we had two very long driving days to get out to Rapid City, SD. Our goal was to meet up with Tom and Ellen, our co-workers for our summer job. 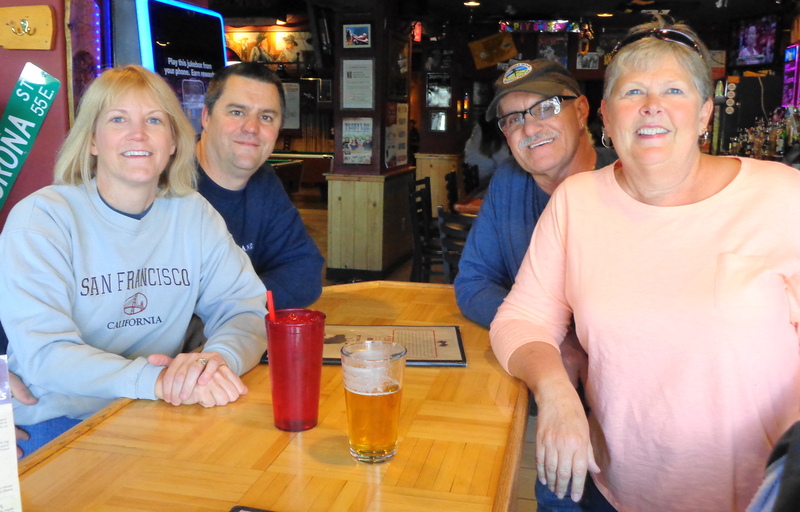 And we wanted to visit with Phil and Rudee, our co-workers from last summer at Crazy Horse. We did make it here in time, and had a nice get together. Unfortunately, the truck started making a bad noise about 20 miles before we arrived to Rapid City, and eventually the ‘check engine’ light came on! So a trip to the Ford dealer revealed the ‘good’ and the ‘bad’. Some exhaust tube thingy in the engine broke, blowing exhaust fumes into the dash, and melting part of the windshield wiper fluid lines. The part in the middle that is all black is the culprit. 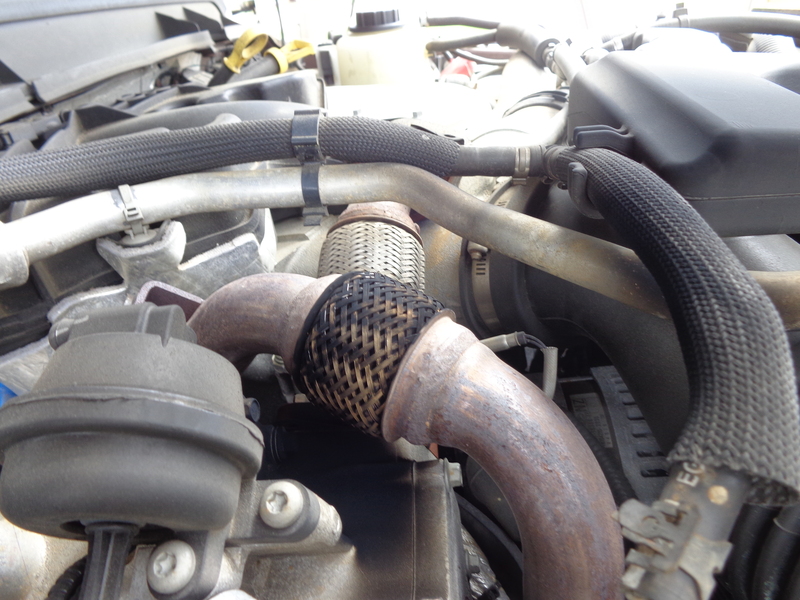 The good news is that all of this is covered under the 100,000 mile manufacturer’s engine warranty. The bad news is they have to order parts from Colorado, and they will not arrive until Monday. Therefore, we will not be able to start our summer jobs on time. And now for the UGLY: There is a winter storm warning this weekend! 6 – 12 inches of snow is expected by Sunday here in Rapid City! Ugh! The Ford dealer is hoping the parts won’t be delayed by the storm. So we are just going to sit still for a few days. We are trying to take a positive view of all of this. “No rain. No rainbows” is a popular slogan in our favorite state of Hawaii. A simple saying, but sometimes you need a few bad things as a reminder to always appreciate the good things. Wish us luck! 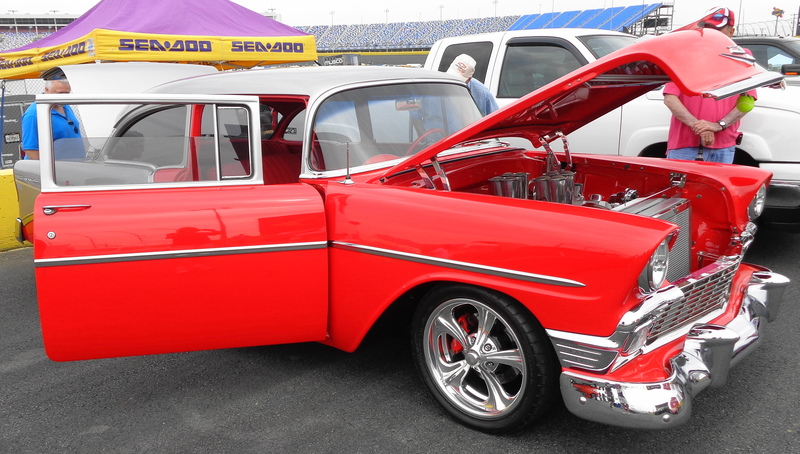 While staying at Ver-El RV park in Concord, NC we were parked across the street from Charlotte Motor Speedway, we noticed a lot of classic cars heading into the parking lot. 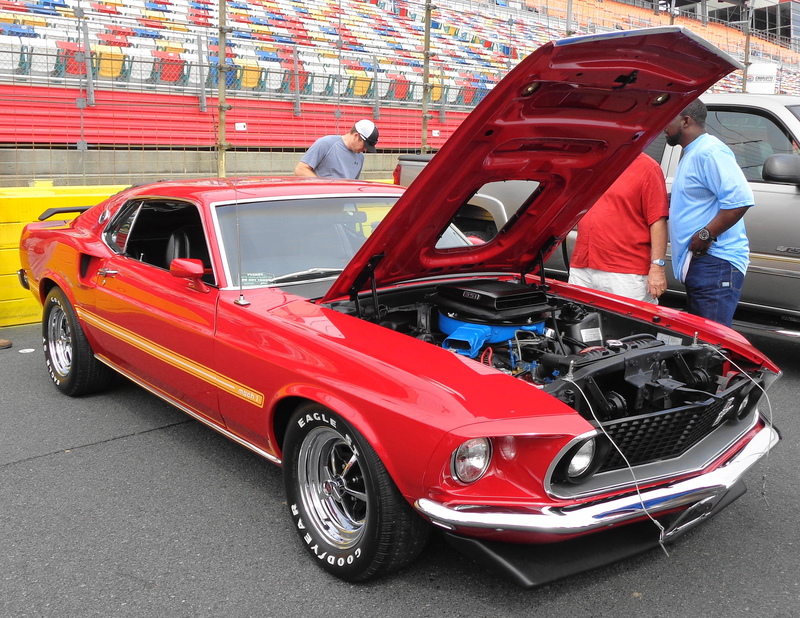 Twice a year the racetrack hosts the Charlotte AutoFair, where owners can put their cars up for sale or trade. 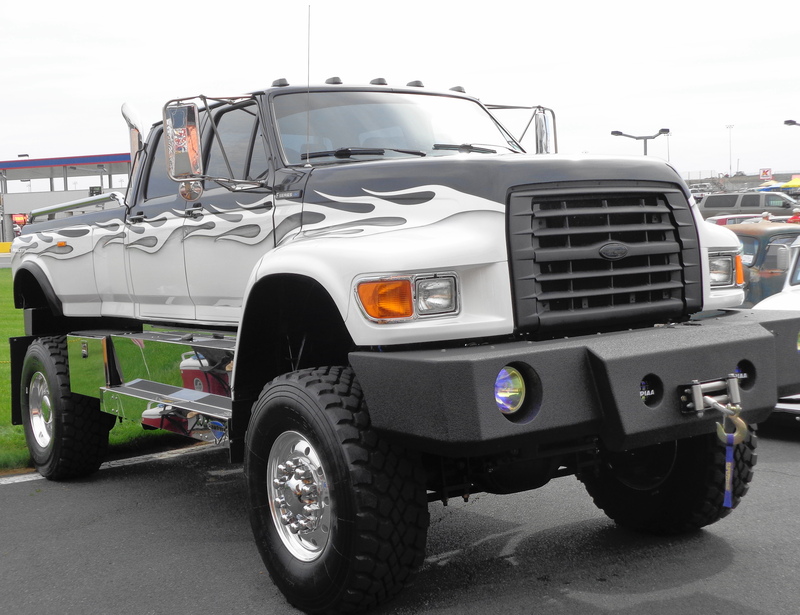 There are also vendors selling parts for every type of vehicle, and displays of some unique vehicles. 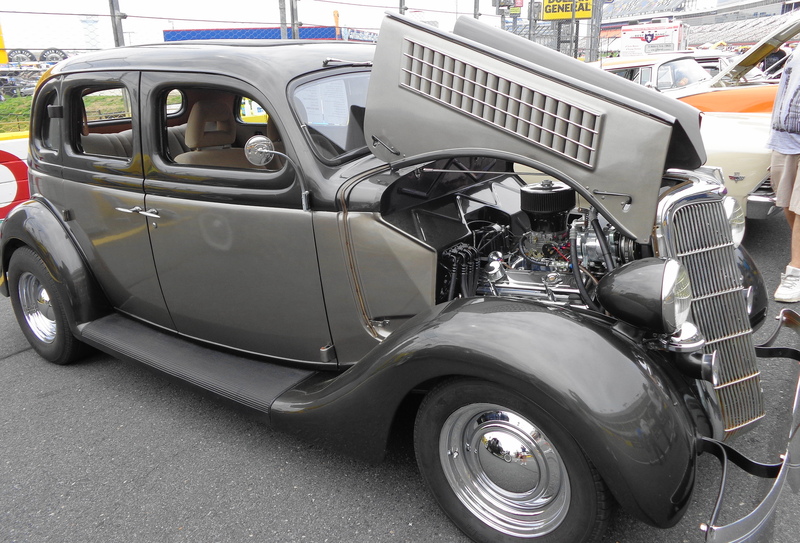 We enjoy looking at old cars, so we walked over to check it out. 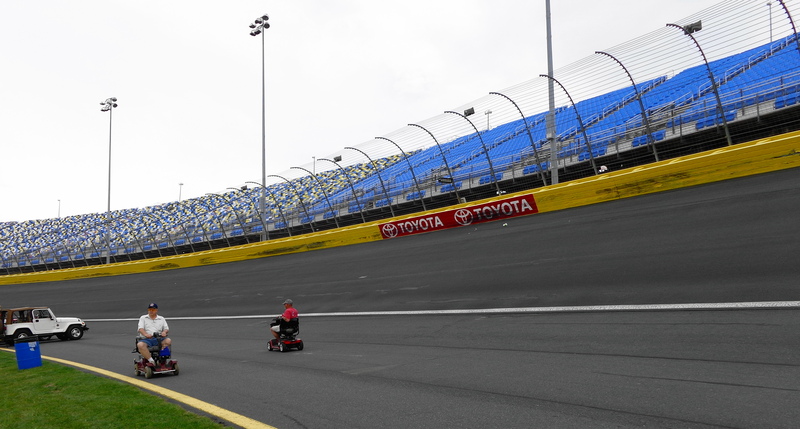 We were also able to wander around and check out the speedway. Here is a view from the infield of the bleachers. 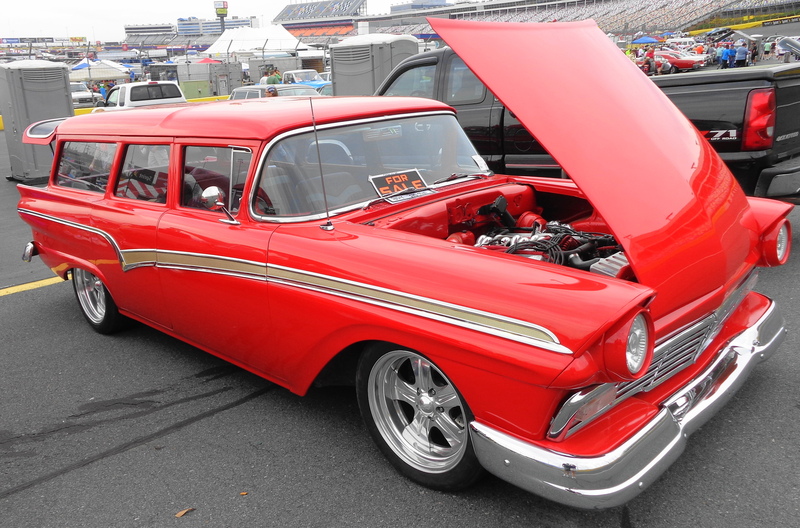 The cars were displayed around the 1.5 mile race track. 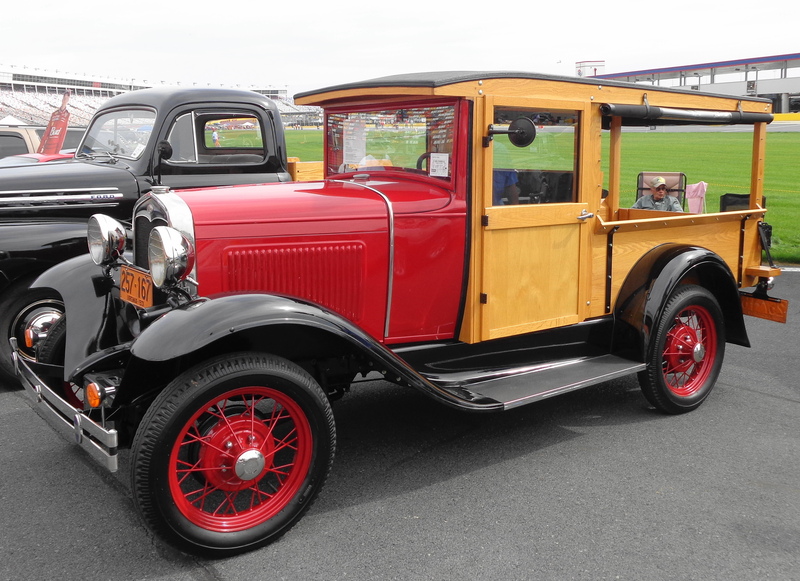 With well over a thousand cars on display, it was hard to pick what photos to display. 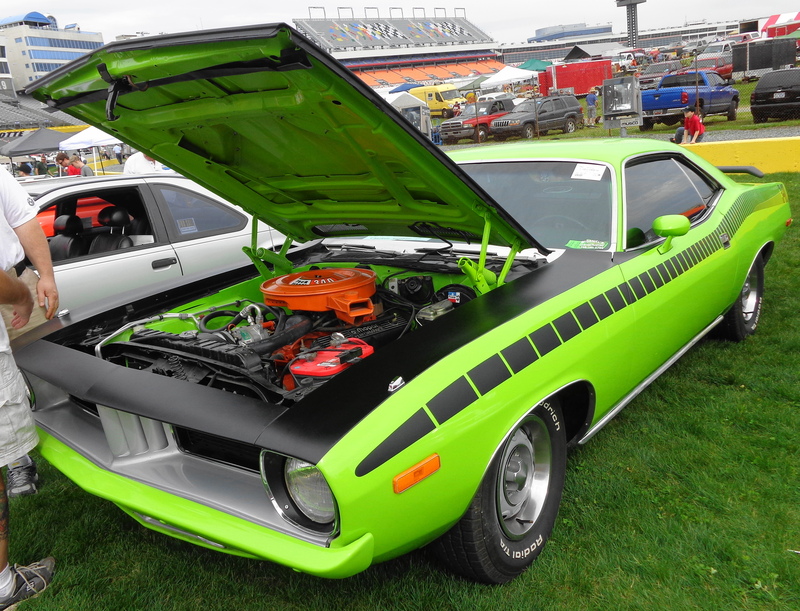 This blog is a bit photo heavy, but if you enjoy cars, we hope you enjoy this post! 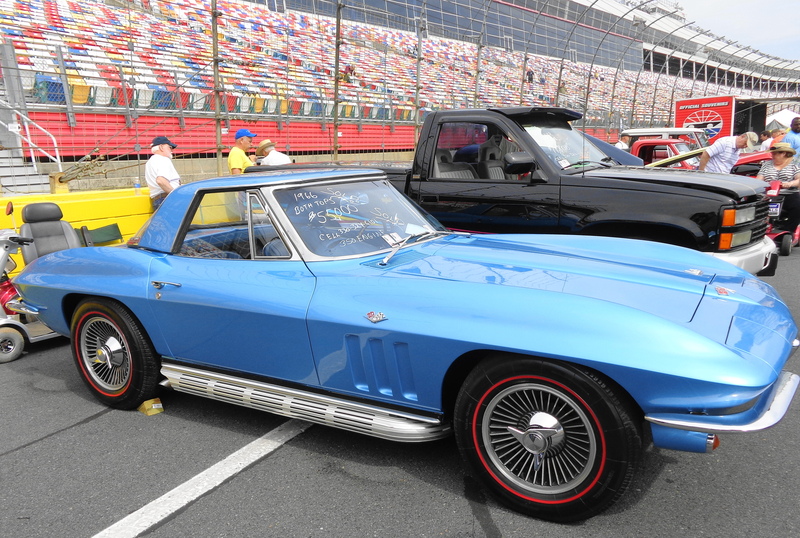 This fabulous corvette was listed at $55,000 and did have a “sold” sign on it. 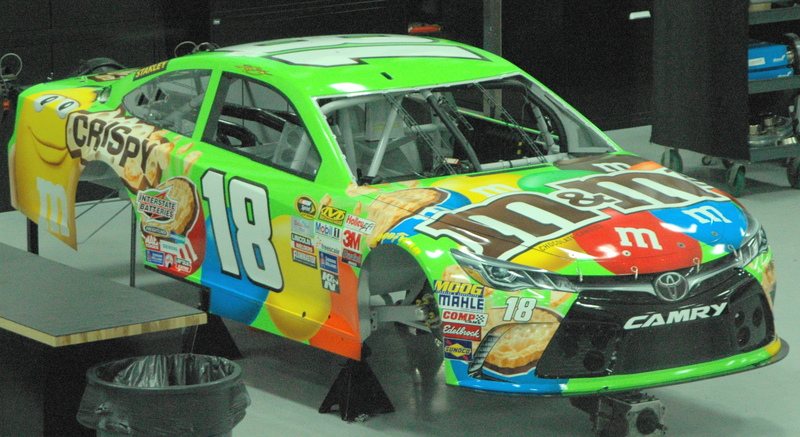 This car is owned by NASCAR driver Kyle Busch. 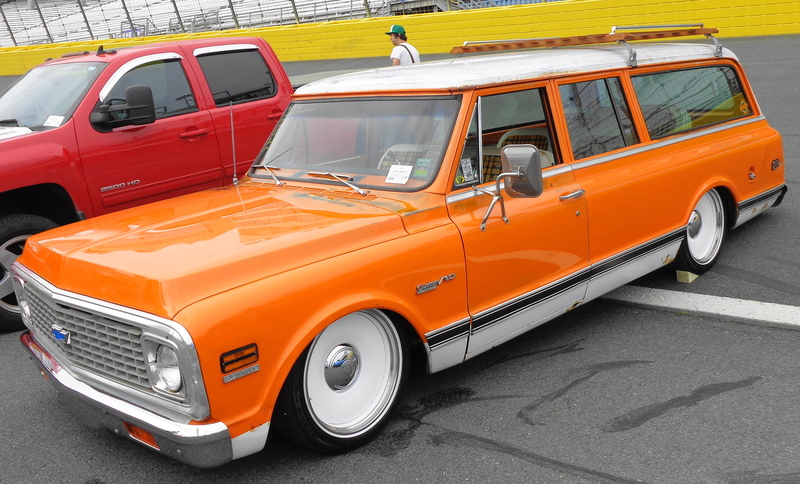 Before the mini van, families traveled in style! 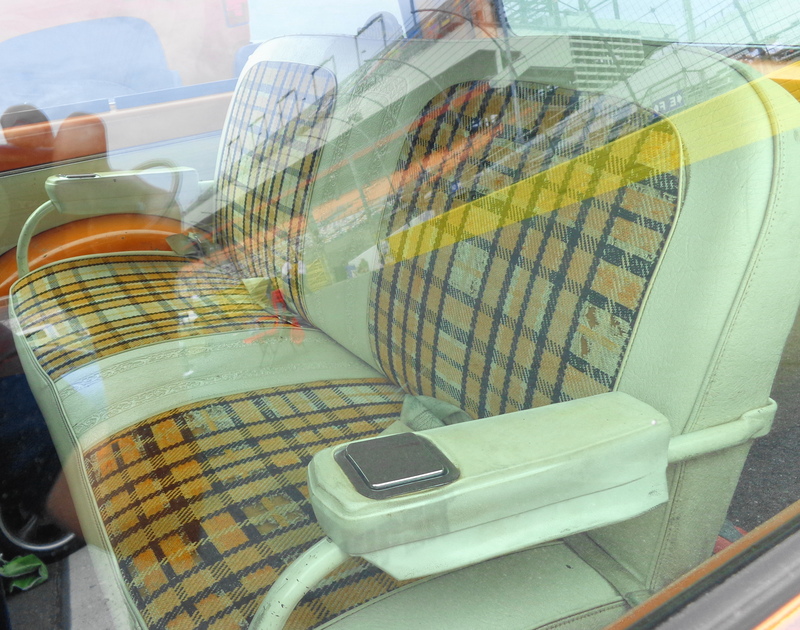 And remember the days when everyone had their own ash tray, even in the third row bench seat of the wagons?! 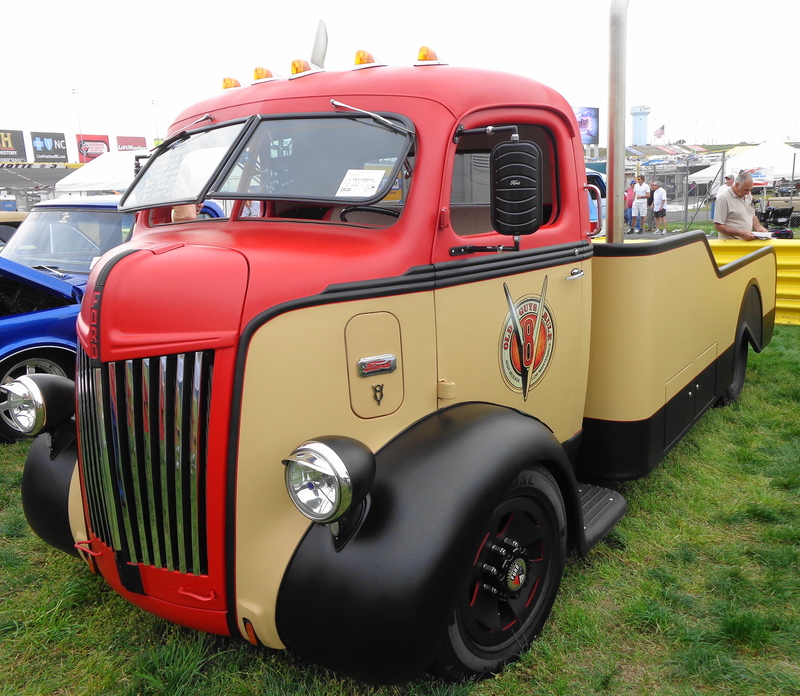 as well as this truck, which could easily tow just about any 5th wheel! 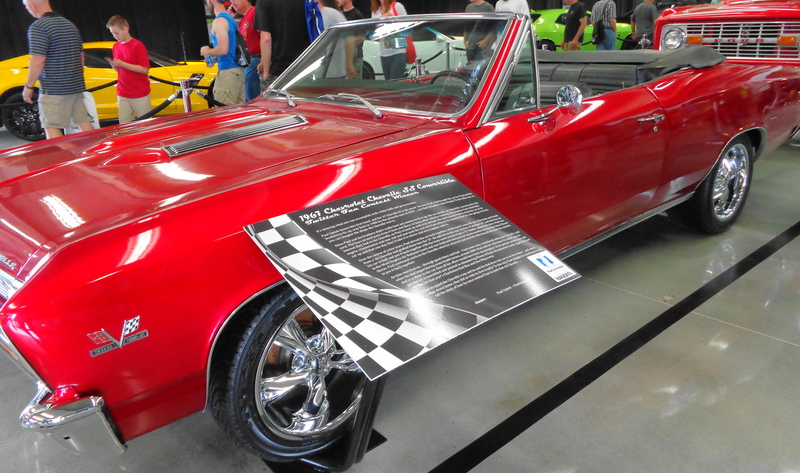 There were some muscle cars on display. And some unique vehicles we have never seen before. 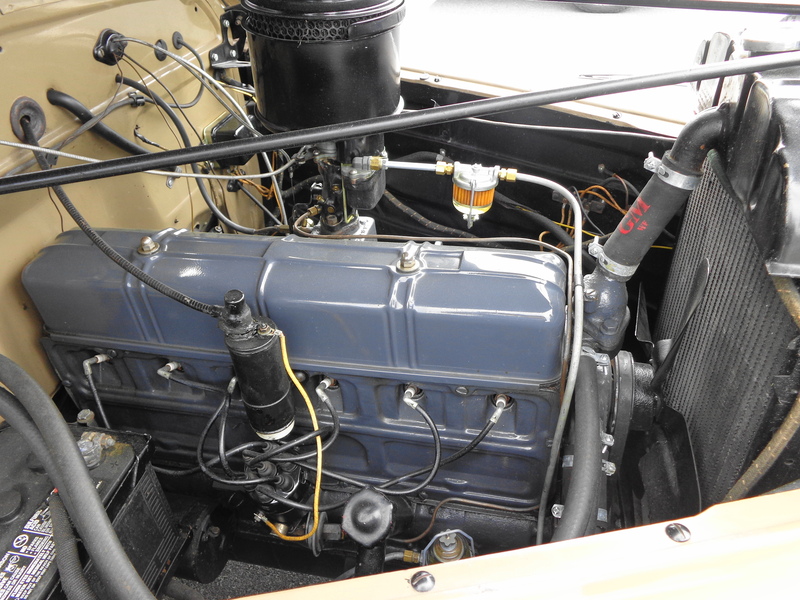 Engines were much simpler in the older cars. 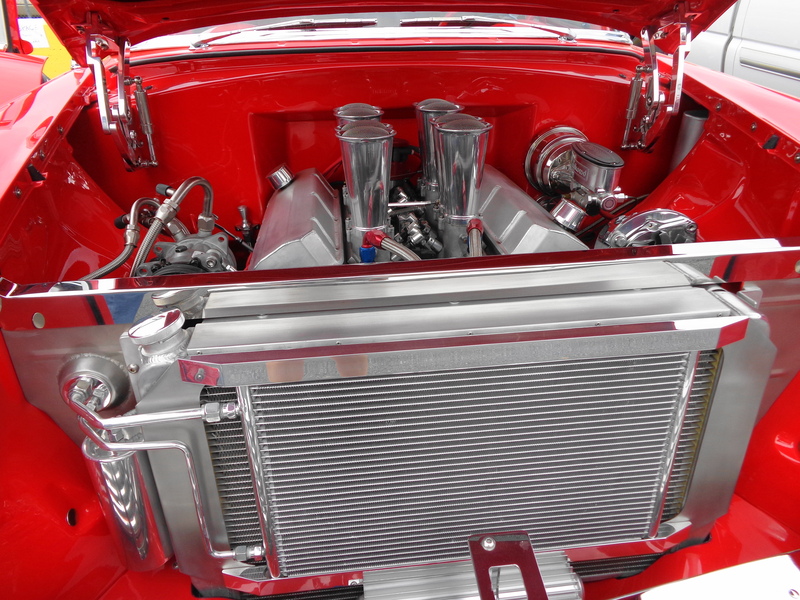 One of my favorites was this 1964 Impala SS that came with “factory power steering”. 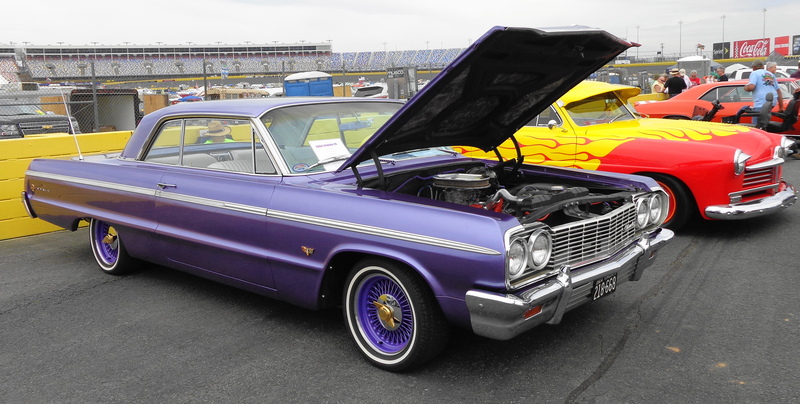 This car is “my age” and was all decked out in purple, my favorite color. 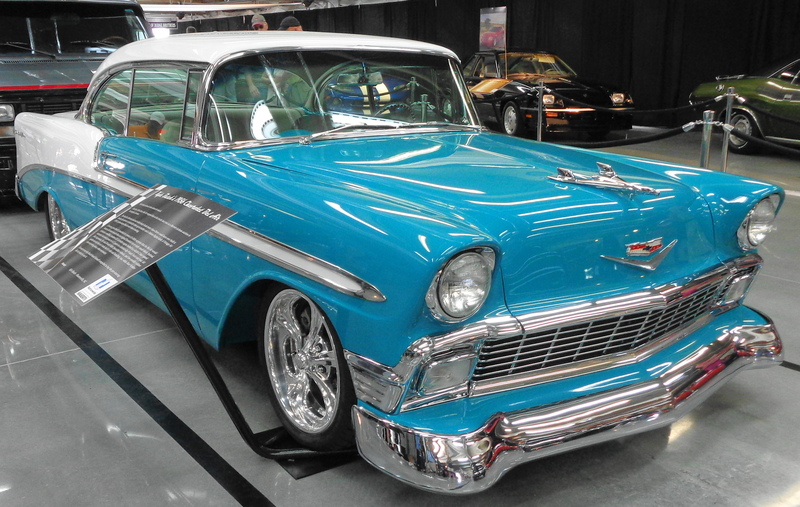 This 1956 Chevrolet Del Ray was getting a lot of inquiries, as it had been fully restored and was immaculate inside and out. I’m not really sure if these guys were planning on taking a spin around the track on their scooters! 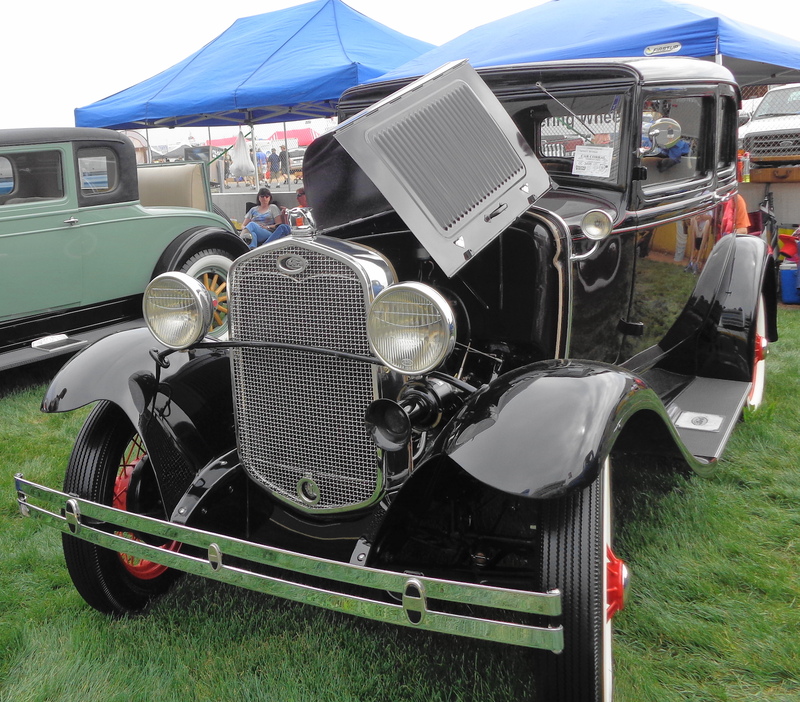 They will have another auto fair in September, so if you are in the area, you may want to check it out. 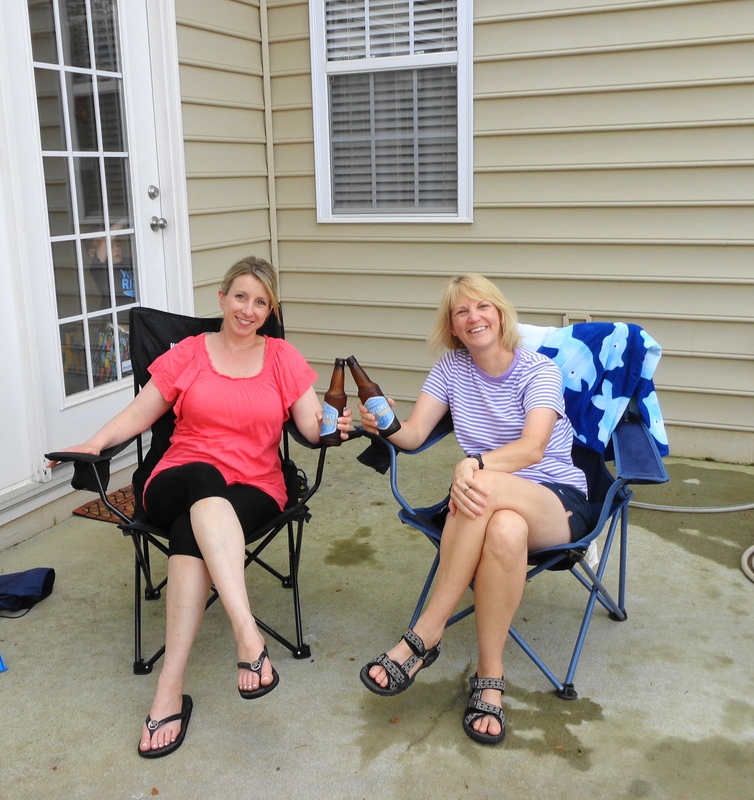 After our brief visit in South Carolina (a state we will definitely explore in more detail someday), we had a relatively easy drive up to Concord, North Carolina to visit with my friend Jodie and her family. Jodie and I worked together as CT Technologists back in Wisconsin. Jodie’s husband Chris has a “work from home” job. Since they could live anywhere, they wisely decided to move from the snow and cold of Wisconsin, to a very moderate climate in North Carolina to raise their two young boys. We found a convenient “campground” at Ver-El Mobile Village in Concord. 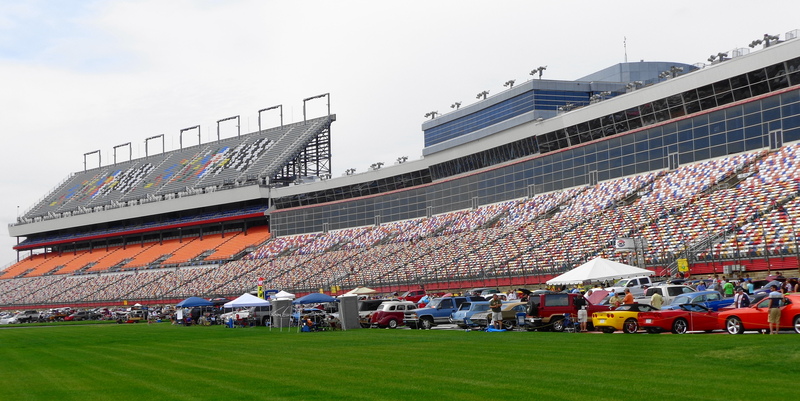 It is right across the street from Charlotte Motor Speedway, has full hookups and was only $25.00 per night. 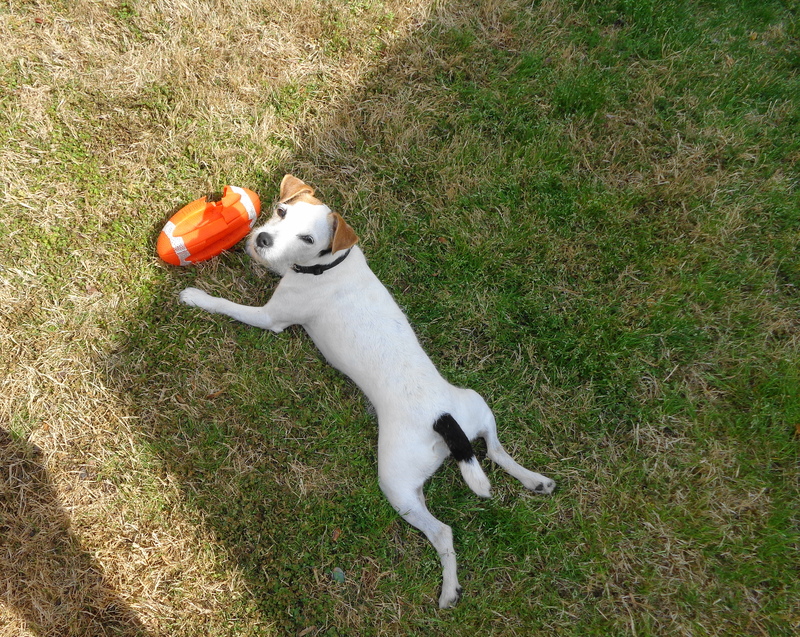 There are no other amenities, it is basically a large grass field, but it was close to Jodie’s home in Huntersville. After arriving, we met up with Jodie and her two boys, Cole and Austin, at the massive Concord Mills Mall. 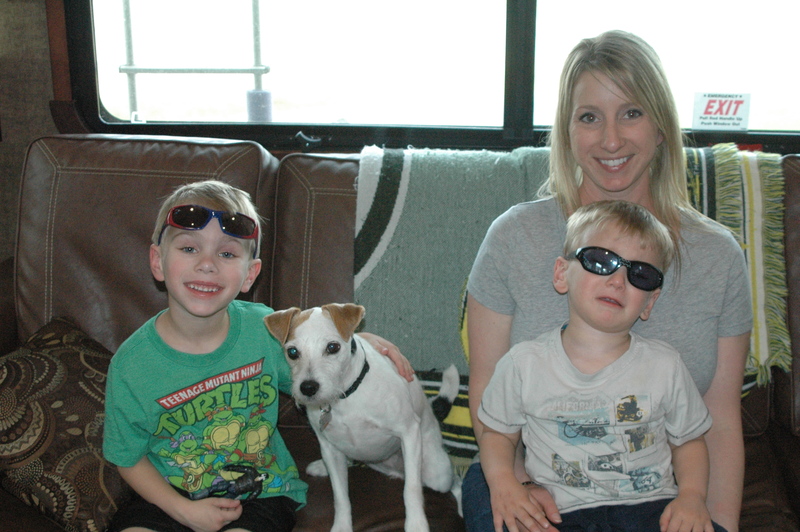 They came over to see our house, and meet Makena, and we had a nice time catching up. It always amazes me that no matter how long you have been apart from someone, it just seems like yesterday when you do get together! We talked about the big influence that NASCAR has in this area, and Jodie mentioned that Hendricks Motorsports was located about one mile from where we were staying, and Joe Gibbs Racing was very close to their house in Huntersville. We decided to add those items to our itinerary. The next day we drove out to Jodie’s home, and were impressed by the many miles of paved bicycle paths all over the area. Jodie stated you can pretty much go anywhere on your bicycle. 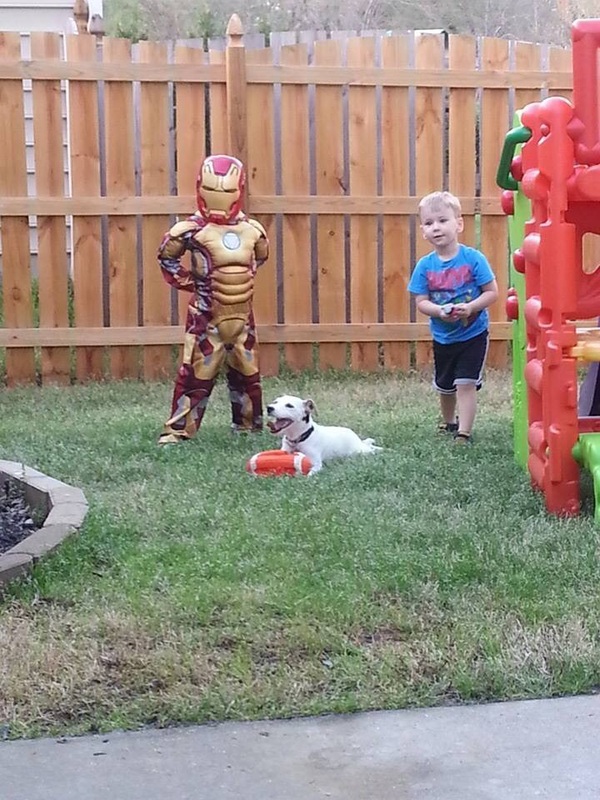 Makena came with us, and she and the boys had a great time playing football in their backyard. Cole decided to challenge Makena! Austin enjoyed bringing dishes of water for Makena to drink out of! Eventually the boys wore her out, and she needed a rest! The adults also had fun too! 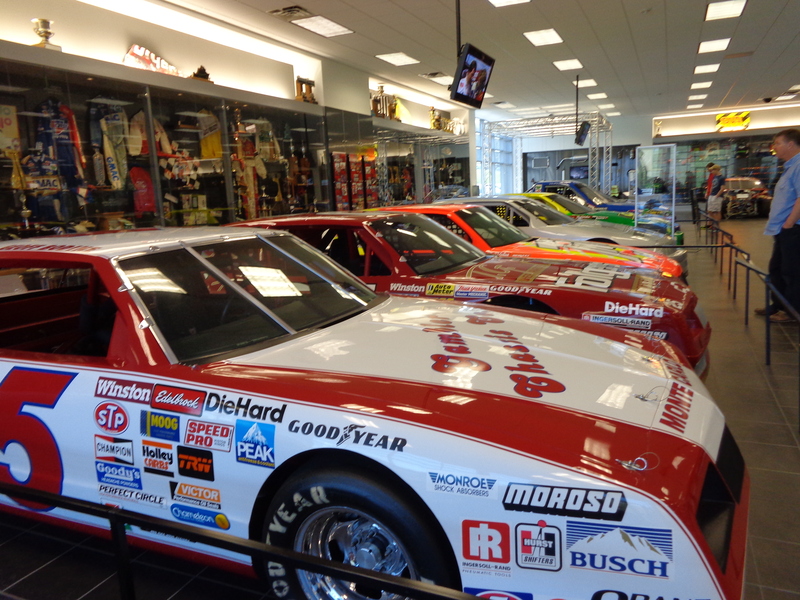 Since we are in NASCAR country, we decided to visit the Hendricks Motorsports complex and toured the free museum, as well as the areas in the garage that are open to the public. 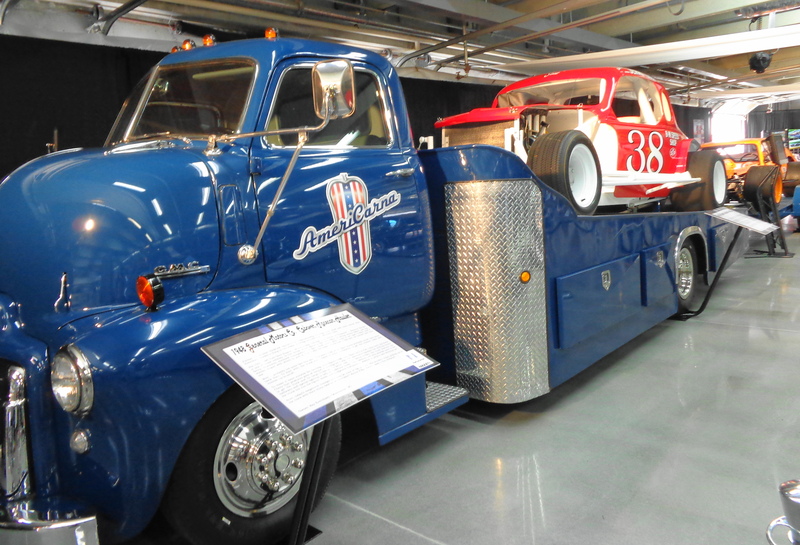 The museum was very interesting, and had multiple cars on display. 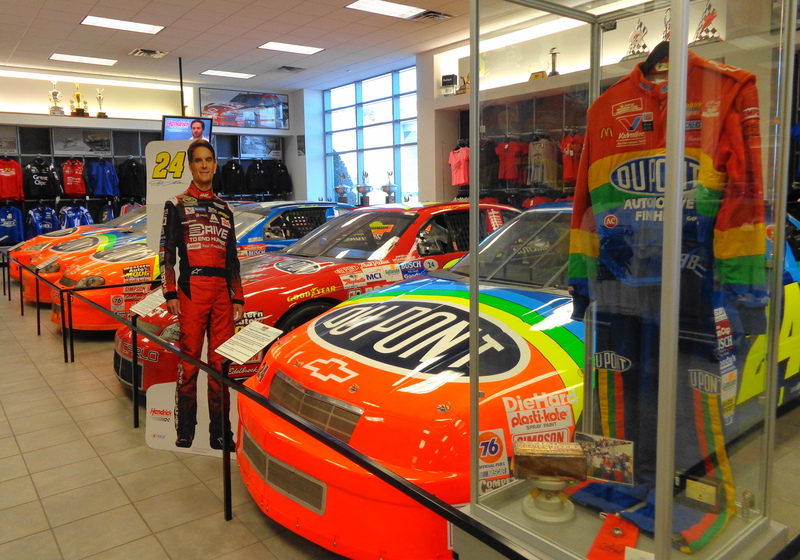 There was a large display of colorful cars for Jeff Gordon, who is retiring this year from racing. 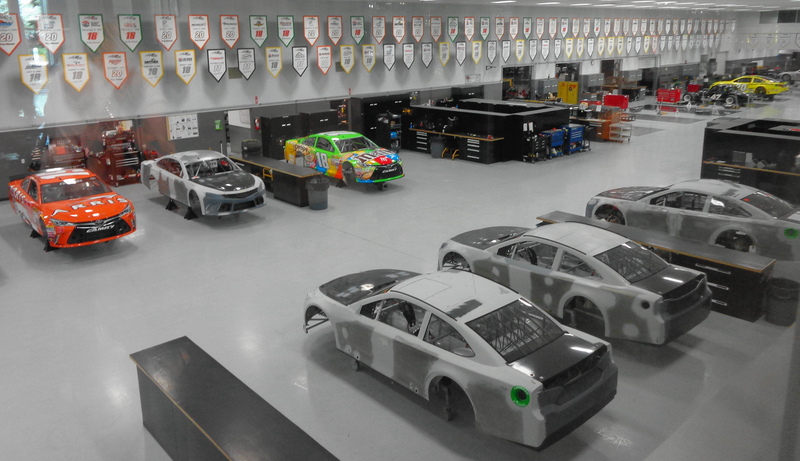 Below are the actual winning race cars from the Daytona 500. 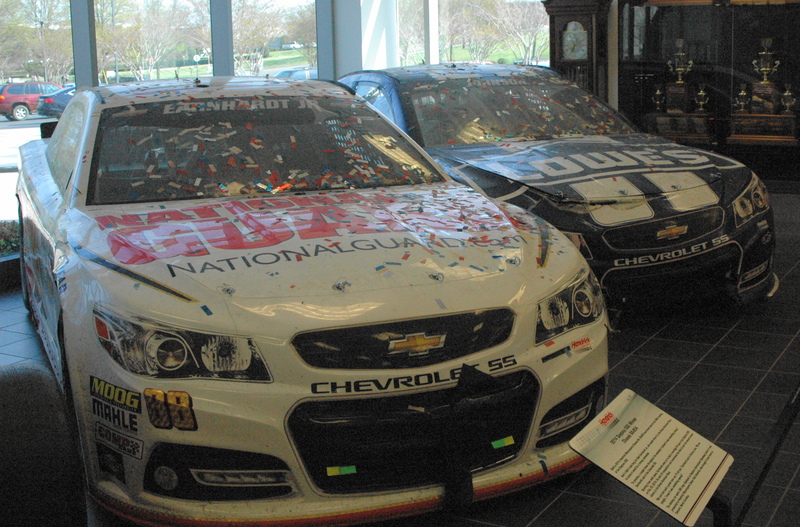 On the left is Dale Earnhardt Jr’s car from 2014 and Jimmy Johnson’s car from 2013. Both cars remain covered with confetti from the winners circle. 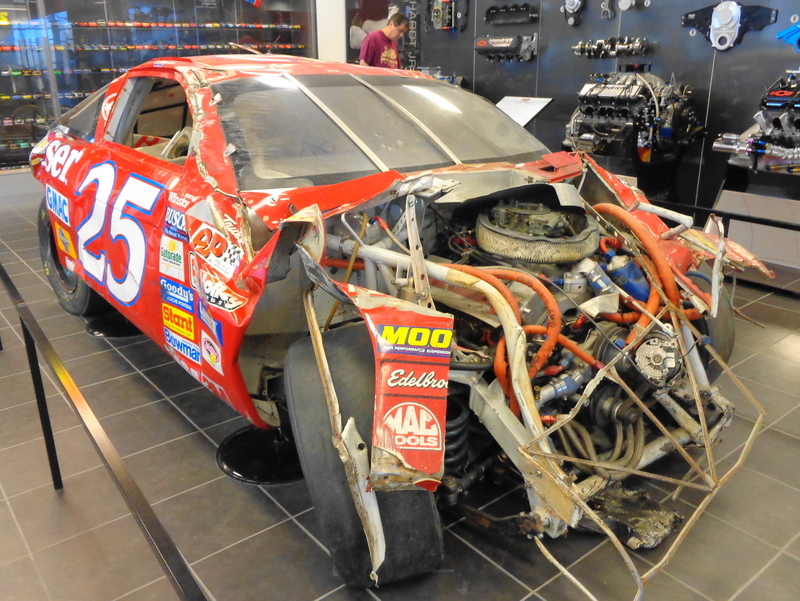 This is Ken Schrader’s Budweiser car from the 1995 Talladega (AL) race. Despite the severity of the crash, he was not injured and walked away from the car. This is probably what my car would look like if I was driving 200 MPH! 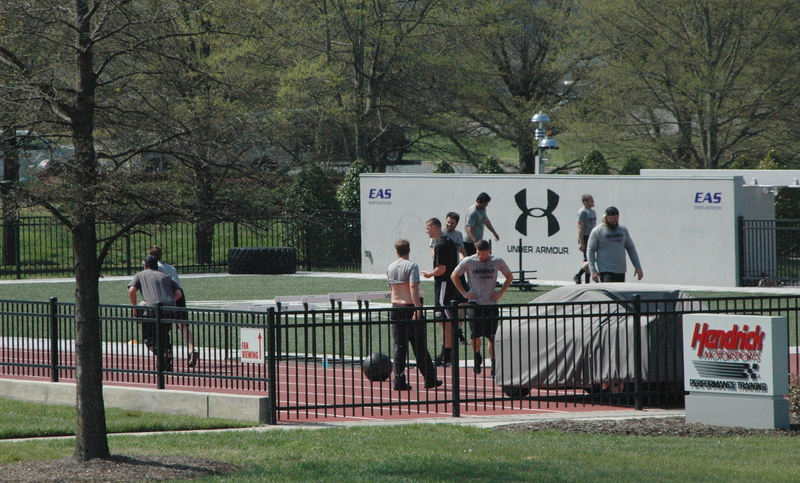 They even have an outdoor exercise facility for the pit crew members, and we happened to be around when one of the teams was working out. 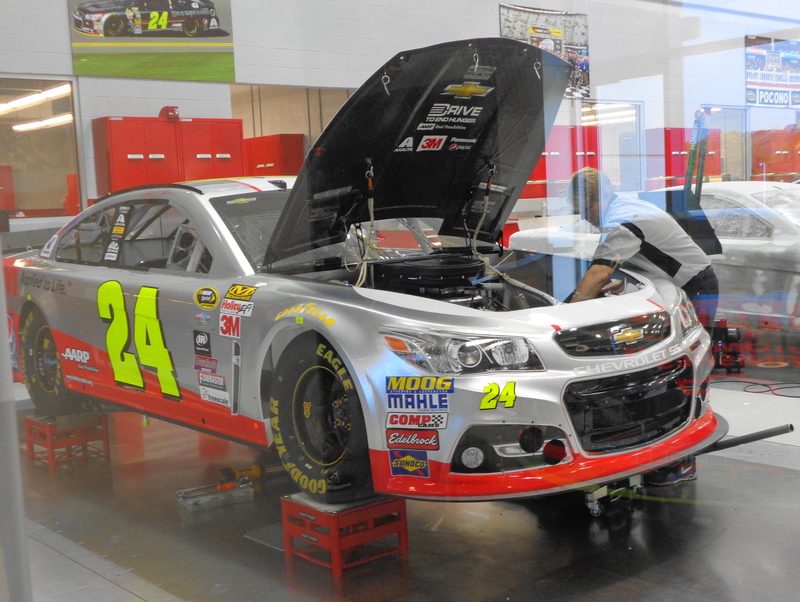 You can view inside the garage to watch the employees work on the cars. 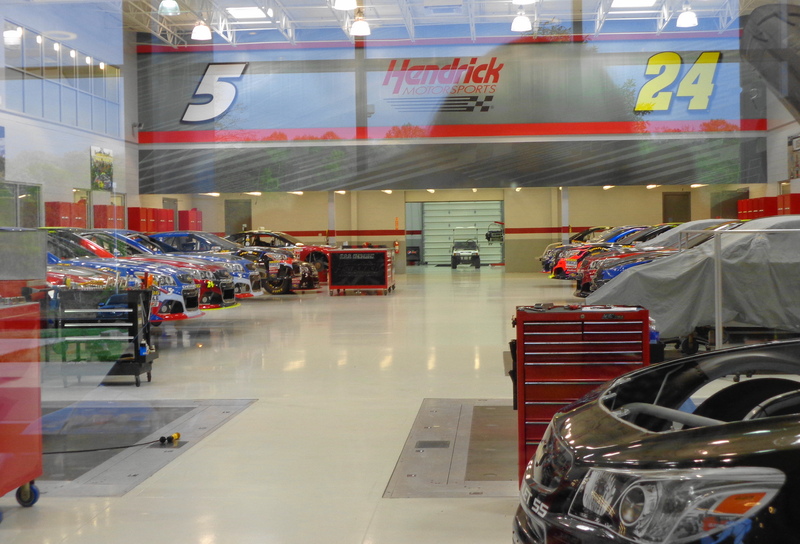 (Only the #24 and #5 car facility was open on this day. The #88 and #48 facility was closed for a private event). Since the Joe Gibbs Racing complex was near their house, we stopped in to check that out as well. The facility is in a newer office park, and really blends in with the surroundings. We were quite surprised by that, and it would be very easy to miss the facility. 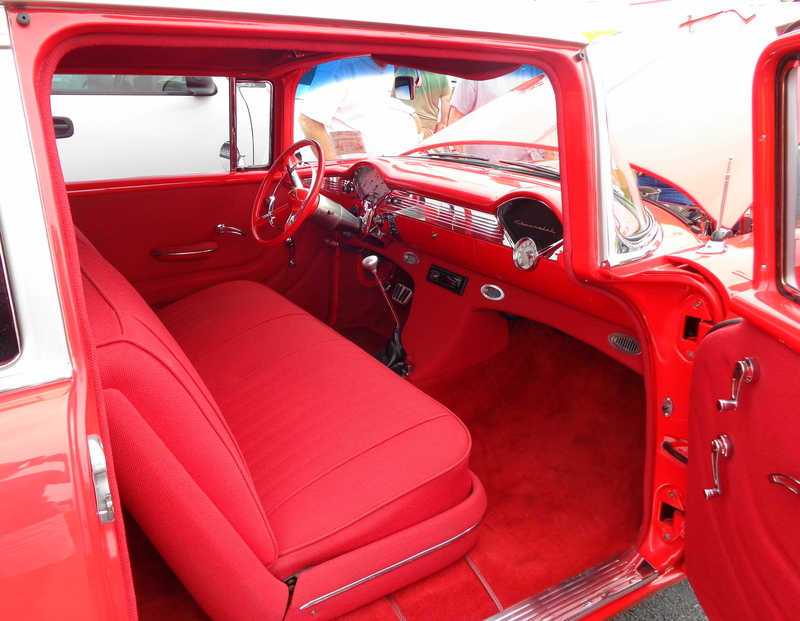 You can also see into the immaculate garage area, at the cars in various states of repair. We met up with Jodie and Chris in town for a nice dinner on our last night. This is a growing area, with much to see and do. Dan and I discussed looking into a work camping job in NC for the future. North Carolina is a one day’s drive to many states. 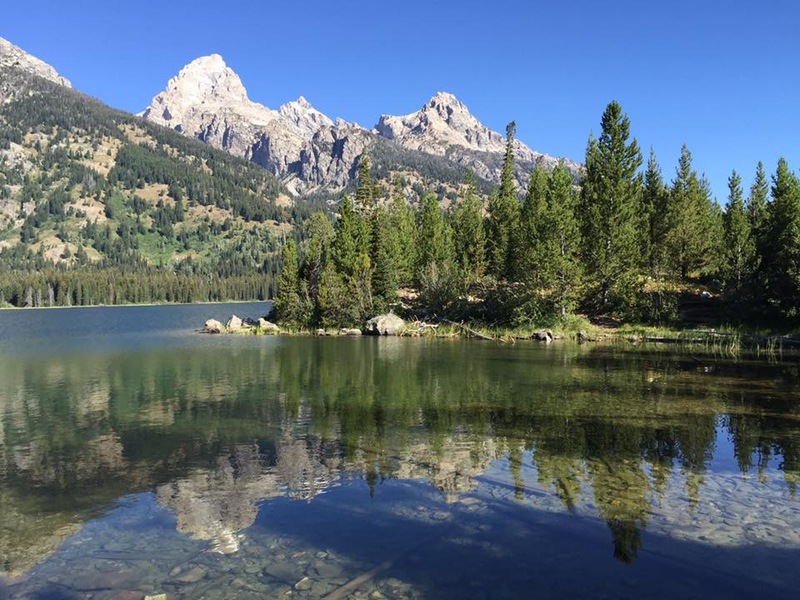 With a moderate climate and low cost of living (compared to Wisconsin), we can see why they chose this area. Thanks again Jodie and Chris! We will be back!